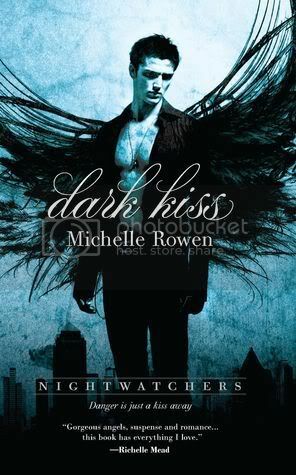 I have read a few mixed things about DARK KISS during the last weeks, so I'm incredibly glad that you enjoyed this! Makes me look forward to reading it (hopefully later this week) a lot more! Thanks for sharing, my dear! Yours is the first review I've read about Dark Kiss, Christy, so I'm happy you enjoyed it overall. :) I'm hoping to read it sometime, but it might be after my library gets a copy. *looks at TBR shelf* After all, there might be a mutiny if I don't read something from the shelf. ;) Thank you for your review! Awesome review! I've been hearing mixed hings about this one, but hopefully I'll enjoy it once I get it. Glad you liked it!!!! I loved Bishop and especially Kraven was awesome!! I can't wait for the next book too! Oh and btw, I am so happy they changed the cover and Bishop is not having this Elvis hair anaymore... Soo much better!! Awesome review! This one is on my wishlist. Not sure when I'll get around to it, but hopefully soon! With the two guys, is it a love triangle? Because Kraven actually sounds pretty awesome, in a hot, snarky way. Haven't read this one but I might have to add it!